Good afternoon. I am grateful to Professor Ko Wang of Johns Hopkins University for putting together this plenary session. And I welcome the many real estate associations—including the Global Chinese Real Estate Congress—that have come together to make this a truly unique event. My remarks will focus on one aspect of the globalization of real estate markets, namely the role of foreign investors. We see frequent discussions of this in the media. For example, here is a recent column by Zoe Williams of The Guardian (Slide 2). 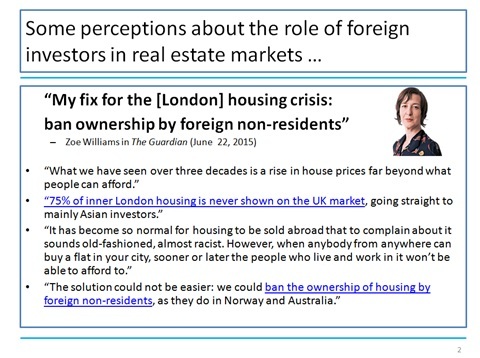 She complains that UK house prices—in London but also elsewhere—are “far beyond what people can afford” and that this is partly because houses are “going straight to mainly Asian investors”. She worries that “when anybody from anywhere can buy a flat in your city, sooner or later the people who live and work in it won’t be able to afford to” and proposes the simple solution that the UK “ban the ownership of housing by foreign non-residents”. What do we know about the role that foreign investors are playing in real estate markets? Anecdotally, there is indeed an increased role of foreign investors. It appears to be driven by three factors. First, there has been an immense increase in wealth, particularly in emerging market economies. Second, interest rates area at historical lows around much of the world, prompting a search for yield among other investments. Third, in a few cases, increased geo-political risks are leading to safe haven flows to particular property markets. For instance, some research shows that has house price increases in London are correlated with increased political risk, which the authors argue drives capital inflows into real estate markets. Foreign buyers accounted for over $100 billion of existing home sales, which is about 8 percent of the dollar volume of existing home sales and about 4 percent of the number of existing home sales. Of course, this means that foreign buyers are a more upscale group than domestic buyers: they buy houses with an average value of $500,000—twice the average value of a home sold to a domestic buyer. Four U.S. states accounted for half of the sales to foreign buyers: Florida, California, Texas, and Arizona. 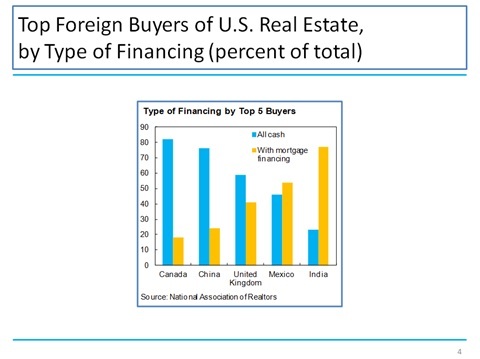 About half of the foreign buyers came from five countries: Canada, China, Mexico, India, and the United Kingdom (Slide 3). Just over half of the purchases by foreign buyers are all-cash purchases. Nationally, about 25 percent of existing home sales are all-cash purchases, with the remainder involving some form of mortgage financing. 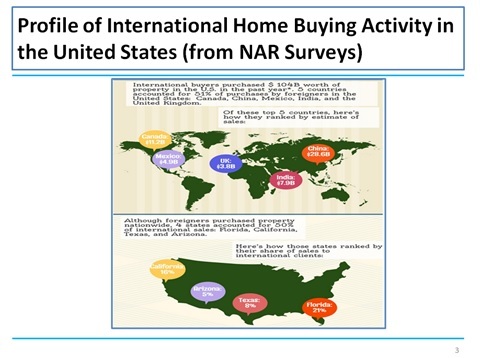 In contrast, about 55 percent of reported transactions with foreign buyers were all-cash sales (Slide 4). While I have focused on the United States, there is also data available for a few other countries, such as Australia (Slide 5), which are the major destinations for foreign real estate investment. 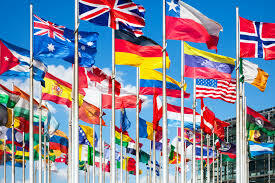 The increases in foreign real estate investment present both opportunities and challenges. Housing has often been regarded as a prime example of a ‘non-traded’ good. As economists, we should welcome the increased opportunities for trade in housing, much as we would welcome any other form of international trade. However, we also know from experience that the benefits of trade come with some short-run challenges. Let me mention a couple. The first is that, as in other forms of international trade, there are winners and losers from the increased trade in housing. In this case, the losers are often domestic buyers who could be getting shut out of particular property markets which are attractive to foreign buyers. Certainly we see many media reports of this kind as I noted at the outset of my remarks with the example from The Guardian. In some cases, the negative perceptions about foreign buyers are reinforced by allegations of fraudulent behavior. 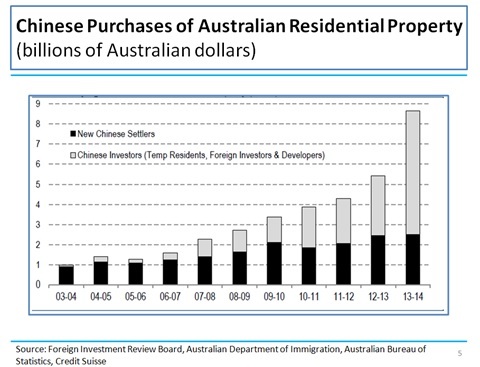 For instance, in Australia, foreign buyers are only permitted to buy new rather than existing residential property. But allegations of foreign buyers circumventing this rule have led the Australian government are to increase monitoring of foreign investment—including increased fines for those found to be in non-compliance—and an increase in application fees for foreign acquisitions to fund the additional monitoring. We should take concerns about the possible short-run adverse effects of the globalization of real seriously. This is both the fair and pragmatic thing to do. At the same time, we should remind people of the long-term benefits from increased trade, and indeed even the short-run benefits. Consider the case of Spain. As is well-known, an over-investment in real estate was a source of the crisis in that country. But there may have been an over-correction as well, leading to a housing market that was too depressed relative to potential. But now, reports suggest that foreign investors are helping to drive a welcome recovery of Spain’s housing market. The second challenge that foreign buyers can pose is to the conduct of macroprudential policy. In many countries, macroprudential tools have been used to contain housing booms. The most common tools are limits on loan-to-value (LTV) ratios and debt-to-income (DTI) ratios. Evidence thus far suggests that these measures are somewhat effective in cooling off both house prices and credit growth in the short run. However, as I noted earlier, many foreign purchases are cash-only transactions. Hence the limits on LTV and DTI ratios may not be effective against housing booms driven by increased housing demand from foreign cash inflows that bypass domestic credit intermediation. In such cases, other tools are needed. For instance, stamp duty has been imposed to cool down rising house prices in Hong Kong SAR and Singapore. Evidence shows that this fiscal tool did reduce demand from foreigners who were outside of the LTV and DTI regulatory perimeters. 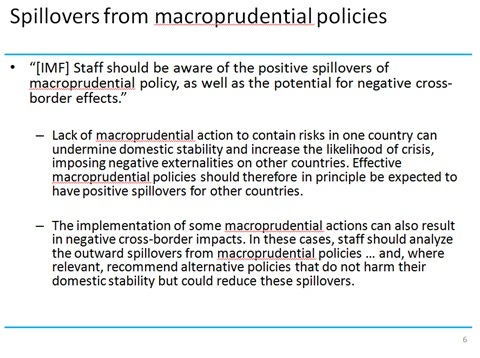 We may also need to consider what spillovers are generated from the presence of foreign investors and how to design macroprudential policies to deal with such spillovers (see Slide 6 for the general guidance given to IMF staff). 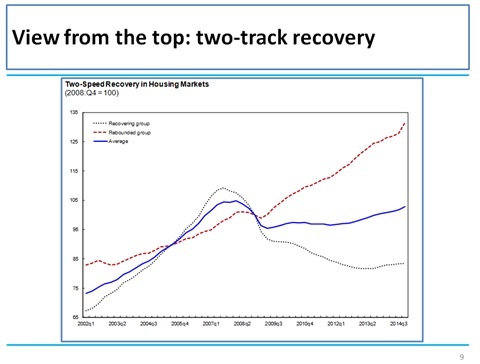 Let me conclude with some remarks on recent developments in global housing markets and, given the interests of this audience, tell you a bit about the IMF’s views on housing markets in China. 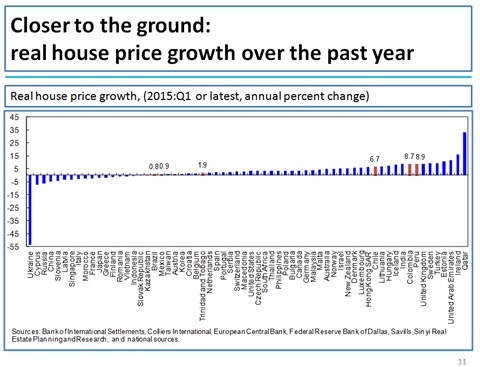 Our Global House Price Index has been inching up for over two years now (Slide 8). After a brief correction at the onset of the Great Recession, many countries have seen robust growth in house prices over the past eight years (Slide 9-11). These include advanced economies—such as Australia, Canada and Norway—and many emerging economies in Asia and Latin America. 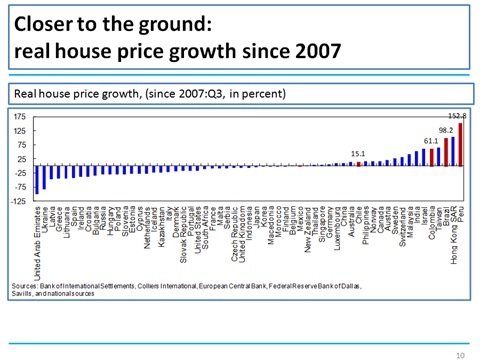 Now this does not mean that house prices are over-valued in these countries. Detecting over-valuation in housing markets requires detailed analysis and judgment. As part of their annual economic analysis of each economy, the IMF staff often does an assessment of the housing sectors as well. 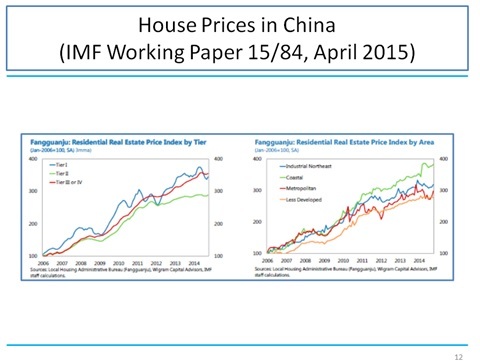 Many in this audience may be interested in our view of China’s housing market. Given the size of the country, we of course have to take a more granular look in this case, using city-level and provincial data. Our country team has provided a comprehensive analysis in a working paper released just a few months ago. They find that prices have been moderating at both the national level and across all city tiers. On average, Tier II and Tier III/IV cities have performed the weakest; across geographical areas, the industrial Northeast and the Coast are experiencing the weakest price development (Slide 12). The softening in prices reflects overbuilding across many cities. Inventory indicators point to a risk that construction has run ahead of demand in some regions. 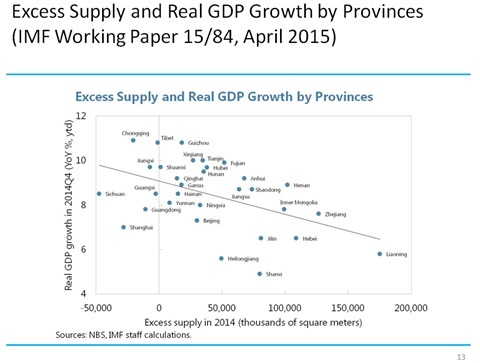 Based on historical data, higher excess supply is usually associated with lower real GDP growth across provinces (Slide 13). The transmission channel is likely through a slowdown in real estate investment, which was a key driver of growth as excess supply built up. An orderly unwinding of this excess supply would be welcome. It will free up resources that can be used more efficiently in other parts of the economy, helping China moving towards its goal of a new and sustainable growth model. The key will be to allow this adjustment to take place, while avoiding a too sharp of an economic slowdown. 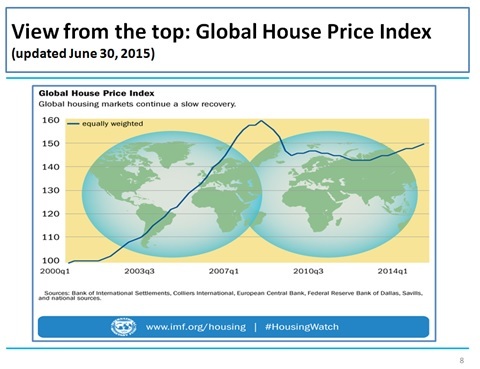 The global housing market has mounted a slow recovery overall. But the situation varies tremendously by country and calls for detailed country-level assessments. The IMF, as part of its annual economic reviews—our so-called Article IV consultations—has increasingly been carrying out such assessments. I provided an example of our analysis for China. Just this year alone, we have carried out assessments of housing markets in about 20 countries. I would recommend these reviews to you as a source of information and also to seek your feedback on how we can do better. The panel discussion today focuses appropriately on an important development, the growing globalization of real estate markets. Like other forms of trade, this will confer long-term benefits. But, as I have argued, we need to be attentive to the short-run costs, particularly those imposed on some domestic buyers, and on the increased challenges for macroprudential policies. 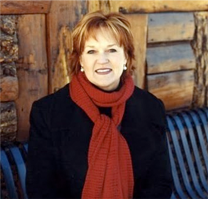 Call Ruth Kruger today at 970.404.4000 or email ruth@krugerandcompany.com to chat about globalization of real estate.